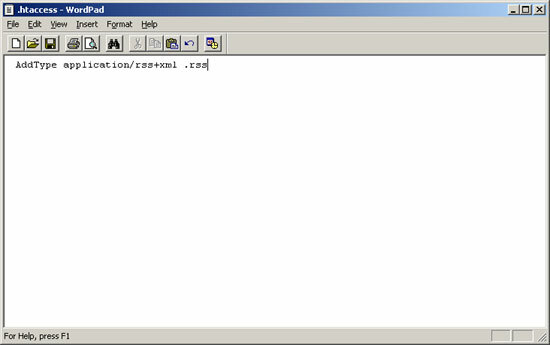 Next a simple text file named “.htaccess” may need to be modified or placed on Apache Web servers. The .htaccess files are used on Apache servers for purposes such as preventing certain computers from accessing a Web server or to password-protect directories on a Web server. If your Web server is other than Apache, you may skip this step. This step is to ensure that an Apache server recognizes the file extension (“.rss”) of your RSS file. If your Web server already has an .htaccess file, download this file and add the text below to it. Save this file as “.htaccess.” You will probably need to rename the file manually because Notepad may automatically add a “.txt” file extension. Upload this file to your Web server and put it in the same directory as your Web site’s main page (i.e., index.html) (Fig. 3). Fig. 3—The .htaccess file must also be placed on the Web server in the same directory as the main page of the Web site.